We ran out of freshies - that is, fresh fruits, vegetables, herbs, etc - from the real world shortly after station close back in February. Since then, our only fresh greens have come from the greenhouse - without it, we would be completely salad-free for almost 9 months. You can imagine then, that having a functional greenhouse is fairly critical for our diets. Beyond that, simply having something else living on station actually does a tremendous job keeping morale up. It distracts people from the cold, dark, lifeless plain we live on. Terry, the greenhouse tech this winter, has done a tremendous job keeping it running, and we've had record yields all season. The main crops are various sorts of lettuce, a wide variety of herbs (basil, chives, etc), and more cucumbers than we know what to do with. About a month ago we had out largest harvest of the season: 160 lbs of greens in a single week (of which roughly 80 lbs was cucumbers). Typical weekly yields are closer to 60-80 lbs, but in any case, it's a lot of food from a 10'x20' room. 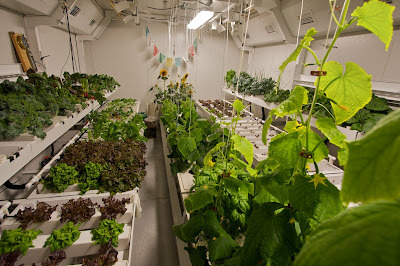 The greenhouse runs entirely on hydroponics, simply because foreign soil is forbidden by the Antarctic Treaty (and the local Antarctic soil is both sterile and buried under 2 miles of ice). The unfortunate result of that is that - given our setup - we can only grow plants in a very few chemistries at once. 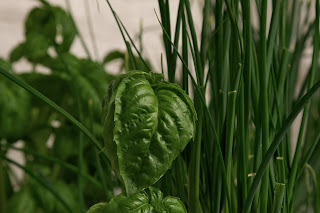 That is, some plants prefer more acidic soil, some need extra nitrogen, etc, and when growing hydroponically, the water they are fed has to be fairly carefully tailored to that plant. While the setup is perfectly capable of growing, say, tomatoes, logistical problems keep us from growing them alongside cucumbers. Due to the vastly greater yield of a cucumber plant, fresh tomatoes are off the menu. Beyond just providing food, however, the greenhouse is also a popular room to relax in. There is a small antechamber/airlock on the front - complete with couch to lounge upon - to allow people to sit in the thick, damp air, soak up the light, and marvel at green things. No other room on station stands out quite like it - when you enter, you're immediately blinded by the light, choked by the humidity, and often overcome by the smell of living things; everywhere else in our world on the bottom of the world, the air is cool, thin and dry, the light is pale, and there are rarely smells of any sort, even around the galley. I made the mistake of spending an evening reading a book in there back in July. Mistake might sound like an odd word for describing time spent in the relative Eden I just described, but allow me to explain. My time in there certainly wasn't unpleasant - quite the opposite: it was a lovely way to spend an evening. The problem is that you eventually have to leave, and by comparison, the rest of the world here seems that much worse. The halls become dimly lit with a pale bluish-grey light, the air thin and cold. Everywhere I went for the next few days, things seemed somehow less substantial, a pale mockery of reality, devoid of color, smell, or any sort of feeling. Within a week of that experience, I was back to enjoying this funny little world we live in, and I've been avoiding the greenhouse since then. Now that the sun is rising, the windows are open, and the world is apparently re-awakening, I may poke my head back inside and see how it strikes me. Then again, I may just wait until I get back to the real world, and try to enjoy my last couple of months here with the ice.